March came in like a lion where I live. The storm came in just at nightfall. Our electric power was out for about three hours so I peeked out the window from a darkened house. Despite complete cloud cover, the light from the full moon on the reflective white of the snow was strong enough to illuminate the scene of tree trunks dancing in the wind. When morning came, I headed outside with my camera to capture the lacy flocking on every tree and bush. I can imagine recreating some of these textures in the first two photos future artwork. The third and fourth photos amused me – their loss of purpose as information because of the snow. Enjoy. Today was delightful. I have been thinking about a challenge given in a quilt group I recently joined… to use cheesecloth as a material in an art quilt. Pondering possible topics, I thought of photos I had taken year earlier and the wonderful wrinkled skin of an elephant. Here are the two reference photos I chose and my drawing made with Caran’d’Ache Neocolor II water soluble crayons on unbleached muslin. The drawing is 18″ x 12″. 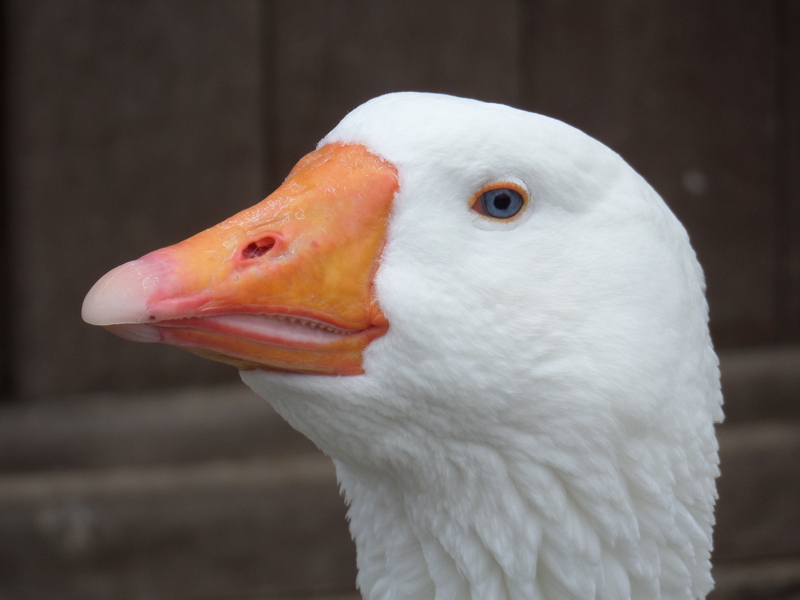 You can see I “repaired” my model’s ear and made her lovely brown eye more open than in the primary reference photo. I remember the red- brown dirt these elephants apply to themselves as insect protection, so added a hint of that color. I like the drawing too much to apply the cheesecloth over it, so I’ll finish this as a raw edge applique on a pale green and free motion quilt on it. I really enjoyed spending an entire day drawing, but I have not solved the dilemma of what to make for the cheesecloth challenge. I am labeling and sorting the photos that I took in the last year. I have a 32GB SD card in my camera, so there are a lot of images to go through before I can clear my card and begin again. 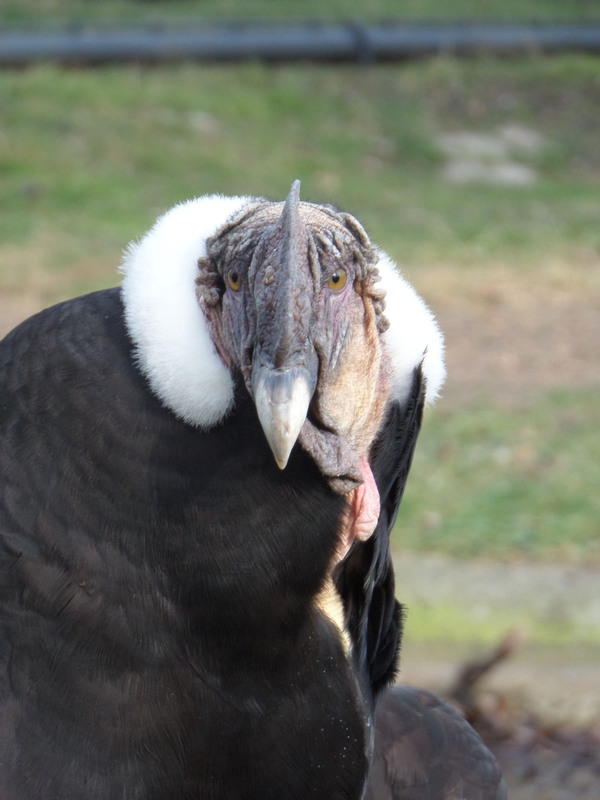 Here are some favorites I took last March when I was able to put a big checkmark next to the item on my bucket list: Spend a day at the Berlin Zoo. 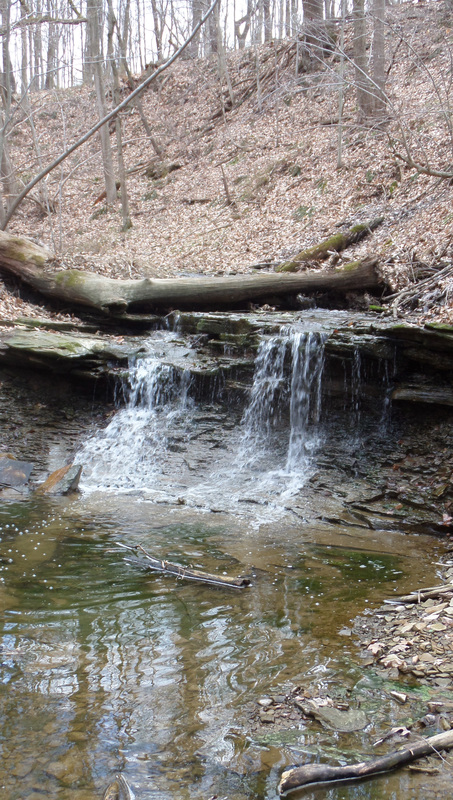 I had a wonderful outing today exploring two county parks near my home. I was on the hunt for spring wild flowers. I saw leaves of several wildflowers and buds just ready to open…this weekend should be perfect for seeing and photographing the spring ephemerals. 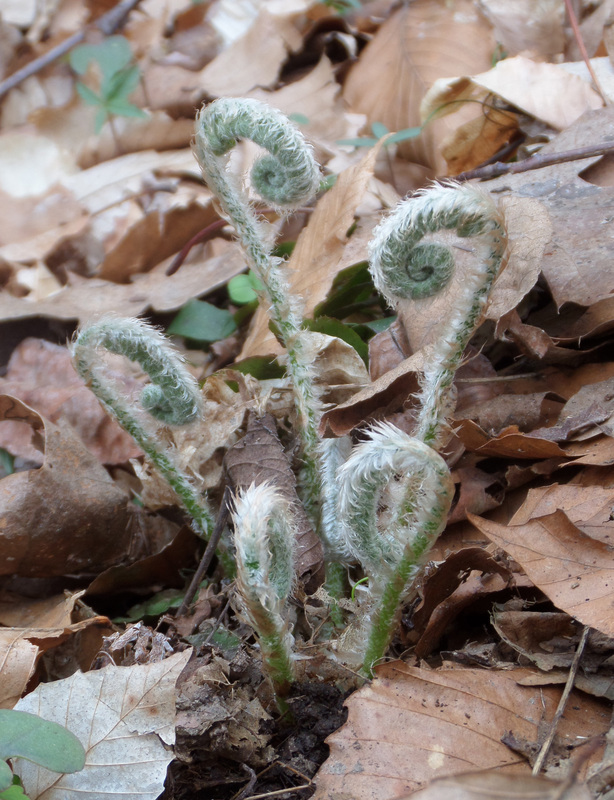 I did find a small waterfall and a few lovely clusters of fiddleheads…baby ferns unfurling. Here are the photos. 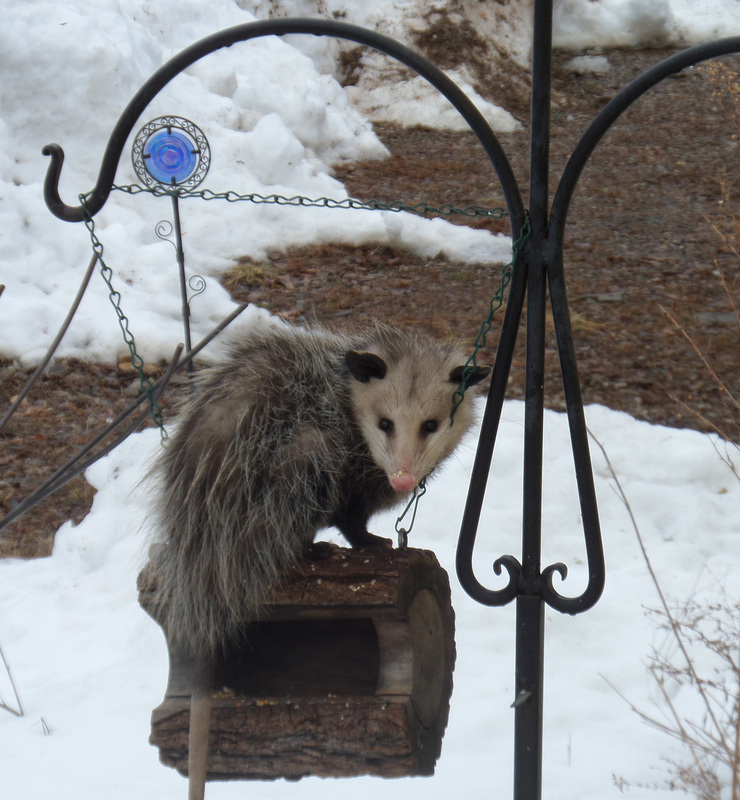 I have a new visitor at the bird feeder this week. to bring it indoors at night when there is a thaw. slowly but has a big mouth with teeth. I had to drive about 15 miles to find some. 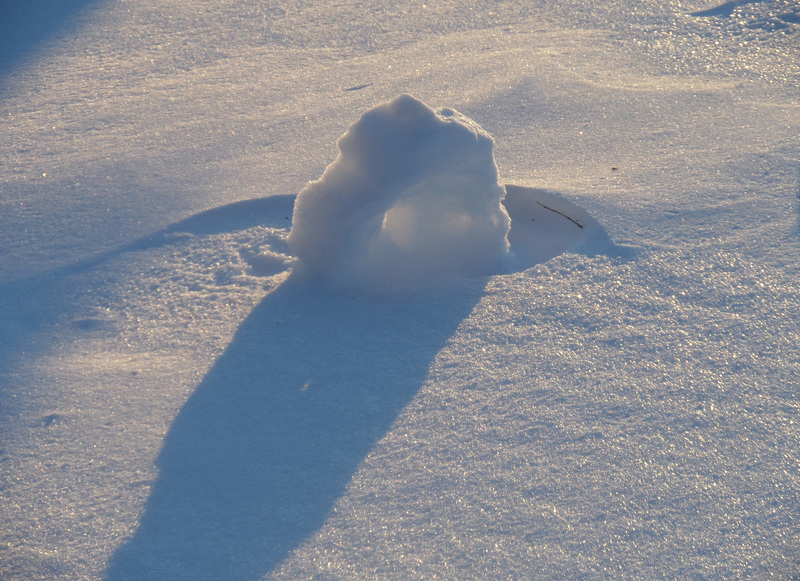 I had heard on the news and seen in the newspaper that there were snow rollers in the area. They are naturally occurring snowballs made by very specific weather conditions: the ground must be covered by ice to which snow does not stick, the ice must be covered in wet loose snow with a temperature near the melting point, and the wind must be strong enough to move the snow rollers, but not strong enough to blow them apart. I found three clusters of them visible from the road, but all were in farmyards where I felt it would be intrusive to get out of my car and begin shooting photos. I was rehearsing my speech, “Excuse me, can I take some pictures of your snow rollers?” I did spot some not near a home on a side road and there was a spot to pull my car off the road. 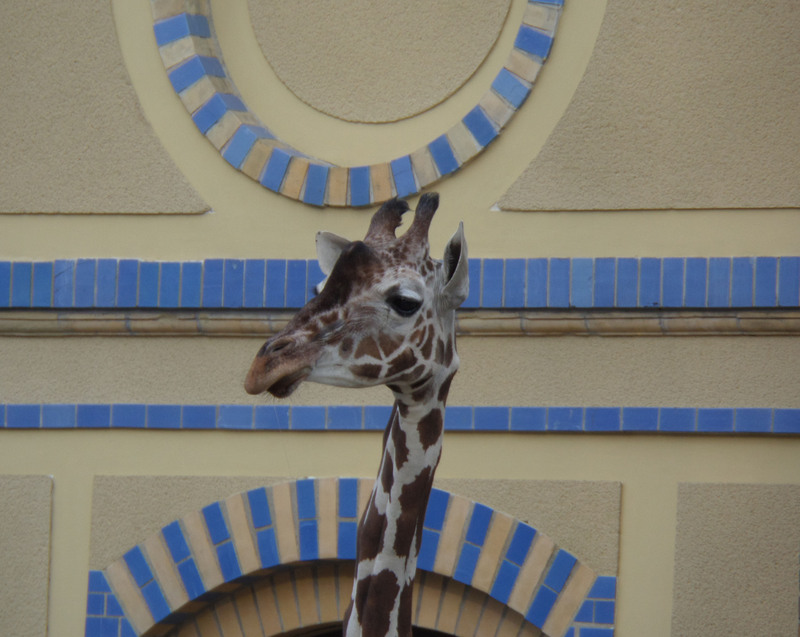 They were only about 5″ tall…but available to photograph! When sunshine flooded in my window this morning and a saw the million sparkles on the snow, I knew I had to get outside to take some pictures with my new camera. Yes, the temperature was 8 degrees F, but I have silk long johns, Smartwool socks, waterproof hiking boots, and can bundle polar fleece around my head and face so just my eyes peek out. 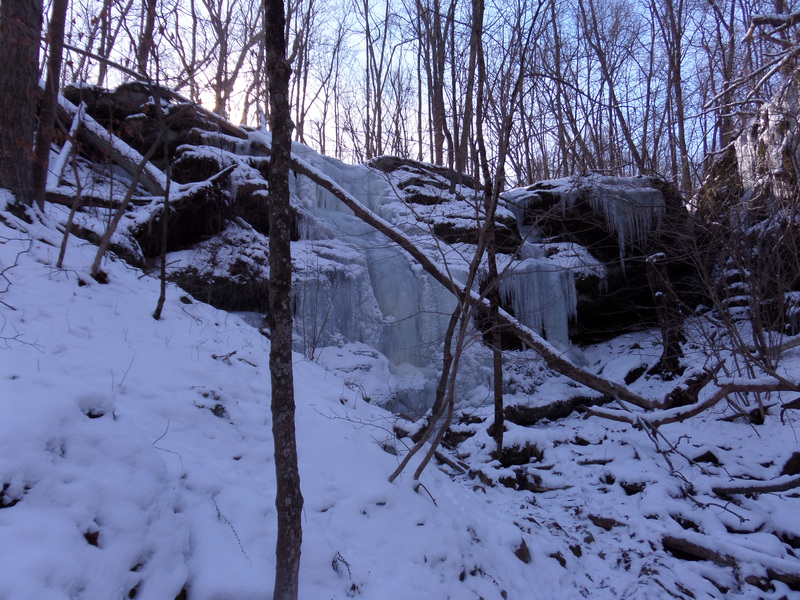 With permission from Mohican Outdoor School, the caretakers of the property, I hiked to Pipes Falls and Hemlock Falls because I suspected the several days of frigid weather would create quite a build-up of ice. The ice was there, but the light was not at the angle I wished. I clicked off a few shots anyway. Alas, now I know the limitations of the battery life of my camera and that it will take exactly three photos after I get the little red empty battery icon. I’m awaiting the next sunny afternoon and my battery is recharged!